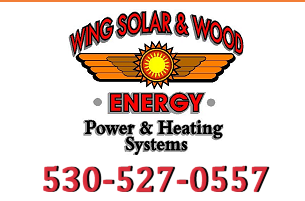 At Wing Solar & Wood Energy, Inc. we want you to have complete confidence in the services we provide. The page that follows has been implemented to answer some of the questions you may have. If you have further questions or we can assist you in any way, please feel free to contact us toll free at 1-800-492-4061. For your convenience, you may also request more information from this site. How much do solar panels cost? How much money will I save with solar panels? Will my solar panels work when the power is out? How much does a solar electric system cost? How much will I save with solar electric panels? Are there tax credits to go solar? Will my property taxes go up if I install a solar energy system? What is a PV system? What is a "grid-tied" solar system? How Much Does a Solar Water Heater Cost? How Long Do Solar Systems Last? What is Hydronic Radiant Heating? What are the benefits of hydronic heating? Does hydronic heating cost more to install? What kind of air conditioning is best with hydronic heating? A typical roof mounted solar installation with 24 panels has an initial cost of approximately $22,000. However, your new solar system installation also has a benefit of a federal tax credit of 30% and full payback can be achieved with energy saving in as little as 5 years. The amount of energy you save with solar panels depends on how much sun you receive. In California, a custom installation of solar panels will provide approximately 1,200 kilowatt hours each year for every 1,000 watts of solar panels. Will my solar panels work when the power is out? Solar panels produce energy when the sun is shining. However, any grid tie system that is connected to the grid will not operate when the grid is down in order to protect the lives of utility workers. It is possible to install a hybrid system that is both on and off grid connected and provides back-up power. Many factors that include how much electricity you currently use, how much you want to reduce your electricity bill, the brand of panels you choose, your roof's orientation such as age and material and the type entrance all contribute to the overall cost of your solar system installation. Generally speaking, a solar electric system can range in cost from about $12,000 to $60,000 and beyond. The average solar system installation costs around $25,000to $35,000. All of these prices are before solar rebates and tax incentives, so the actual out-of-pocket cost can be much lower. The best way to find out how much solar energy will cost for your home or business is to contact Wing Solar & Wood Energy, Inc. for a consultation and comprehensive quote. We can be reached toll-free at 1-800-492-4061. How much will I save with solar electric panels? Depending on how much you spent on energy in the past and the size of you solar system you can potentially save hundreds to thousands of dollars each year. Also, keep in mind that California energy costs are continuing to rise, so your solar savings will also increase. Are there tax credits to go solar? There is currently a 30% federal tax credit for any qualifying residential or commercial solar electric system. This tax credit is scheduled to expire on December 31, 2016. However, several organizations are currently lobbying to extend this time frame. Will my property taxes go up if I install a solar energy system? No, your property taxes will not go up if you install solar panels. For now, the value of your property in California cannot be re-appraised for solar-related property improvements. A PV or photovoltaic system is a solar electric system which converts solar energy into usable power for your home or business. The basic building block of a PV system is referred to as a cell. When numerous cells are put together they are called a solar module, and many solar modules assembled together form a solar array. A PV system will consist of an array of modules and an inverter. What is a "grid-tied" solar system? A grid-tied solar system is one that connects directly into the wires of your utility. This allows you to use electricity from the grid and export excess power for credit. The installed cost of a solar water heating system ranges from $4,500 - $6,500, depending on the system type and the difficulty of installation. Although the upfront cost of solar water heating is more than conventional water heaters, the operating cost is significantly less than electric or gas heaters, saving you 60% - 70% on your annual water heating bill. A properly designed and installed solar water heating system will perform well for 30 - 40 years depending on the type of system and how well it is maintained. When considering an average 30 year life for a solar water heating system, a 10 year payback really means 20 years of free water heating and protection against future increases in gas or electricity rates. The real savings occur after the system has paid for itself and you are able to enjoy the free energy produced by your system, when the cost of energy from the utilities will have increased significantly. Hydronic radiant heating uses a boiler that heats the water and is circulated through the subfloor of the house in tubes that go directly to radiators, baseboard heaters, or beneath floorboards. Radiant heating is an attractive alternative heating method for many reasons including that heat is evenly distributed because air does not get lost in the ceiling, it is much more quieter and environmentally sound. Hydronic radiant heating provides a much more even heating experience. There are no hot/cold spots within the home. You can also use hydronic heating to heat sidewalks or driveways around your home to melt snow instead of shoveling it. In addition, with hydronic radiant heating there are no vents so you can move your furniture and appliances where ever you want without worrying about blocking a vent or causing a fire hazard. Does hydronic heating cost more to install? Yes! The cost of hydronic heating installation is slightly higher than furnace air heating. However, because hydronic heating is more efficient and zoning controls can be added, money is saved in the long run because your boiler will use much less energy than a traditional gas or electric furnace. Typically, your hydronic heating system will save approximately 33% on your overall heating expenses. What kind of air conditioning is best with hydronic heating? Because your hydronic heating system uses sub-floor tubing, air conditioning must be installed separately. In able to do so, you can choose to use a ductless split air conditioning to circulate air from an outdoor condenser or you can also install a packaged air conditioning system that utilizes ducts. We hope this page has answered some of your questions. Again, if you have further questions or we can assist you in any way, please feel free to contact us toll free at 1-800-492-4061. For your convenience, you may also request more information from this site.